I’m on day 4 of the ketogenic diet (very low carb, high fat, moderate protein). So far it seems to be going really well! I feel good mentally and physically, the pain is much reduced (barely even any at all! ), and I’m losing a lot of water weight. I’m trying to get as much low carb veggies and berries as I can into my diet, as well as almond butter for minerals and antioxidants, and the rest of my diet is high quality meat, cheese and yogurt, avocados, coconut, seafood, and fermented veggies. I thought I would miss potatoes and grains, but so far I’ve been subbing cauliflower and almond flour and it’s great! I’m going to stick to it for at least a month and see how it goes for me. 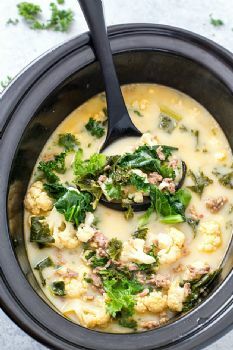 This is the soup I’m making this weekend — zuppa toscana in organic bone broth with cauliflower instead of potatoes 🍲 delicious! You have an amazing plan and some yummy food too. I love the soup. Soup is my favorite food. Have a great week my friend. Hang tough you can do this! some keto people tend to ignore veges, but you are doing well incorporating these and getting your micro nutrients and fibre. very pleased to hear of someone using fermented veges. I'm glad it's working so well for you! I tried keto, and it didn't make me feel very good. But I'm a firm believer that every body is unique, so if it works for you, that's awesome! That soup looks sooooo good.